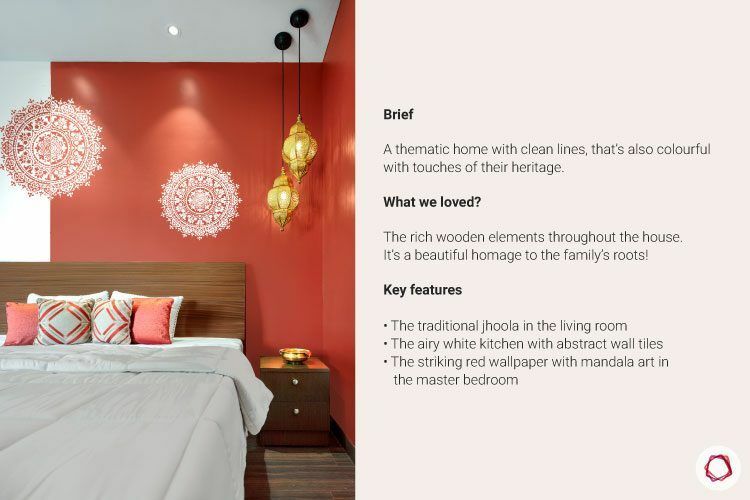 Indian home decor with pops of colours and lots of creative nooks! 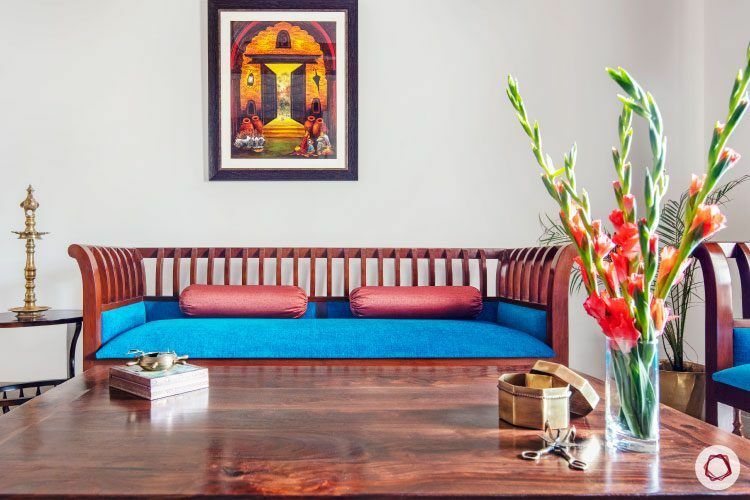 Abhilash Pillai and his wife, Kamalika had always wanted a home that would honor his Kerala roots and her Kolkata roots in Noida. After living in a 2BHK for sometime, they decided it was time to move into a bigger space and build their new dream home! 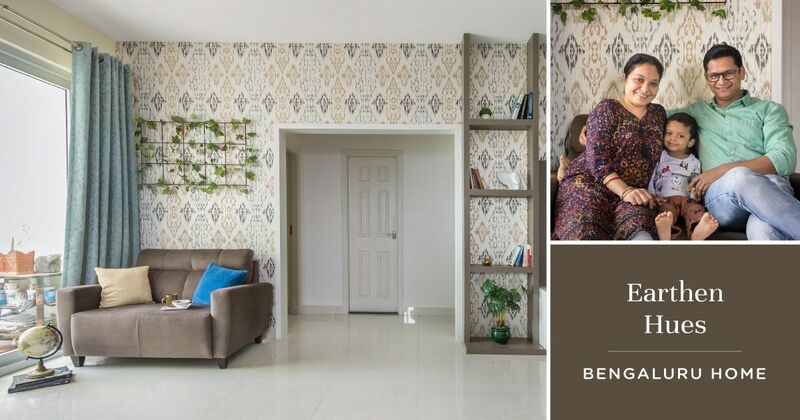 After an extensive search, the lawyer couple fell in love with a 3BHK in Excotia Fresco that had all the amenities they were looking for. Being on the 12th floor, the home also overlooked two beautiful parks. To deck up their brand new home, they had approached a local designer. However, the designs didn’t quite match up to the image of their picture-perfect home. And that’s when they decided to contact Livspace. They met with Kajal Sood, our designer, and Praveen Orasangi, Design Manager. 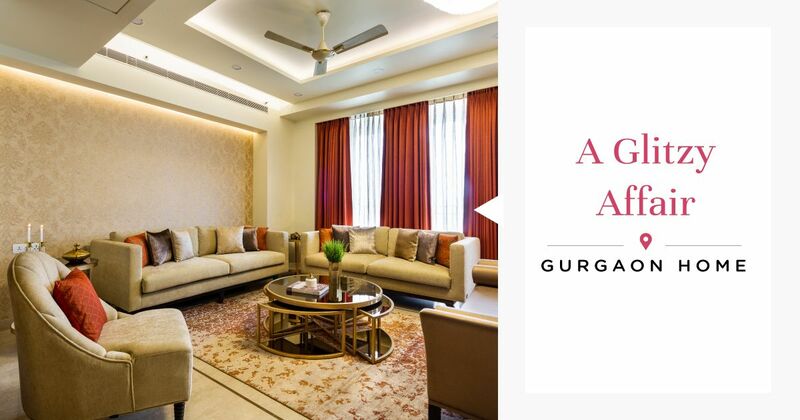 And they knew, from day one, they were much closer to their dream home with Livspace! Abhilash and Kamalika explained to Kajal that they wanted a thematic home. 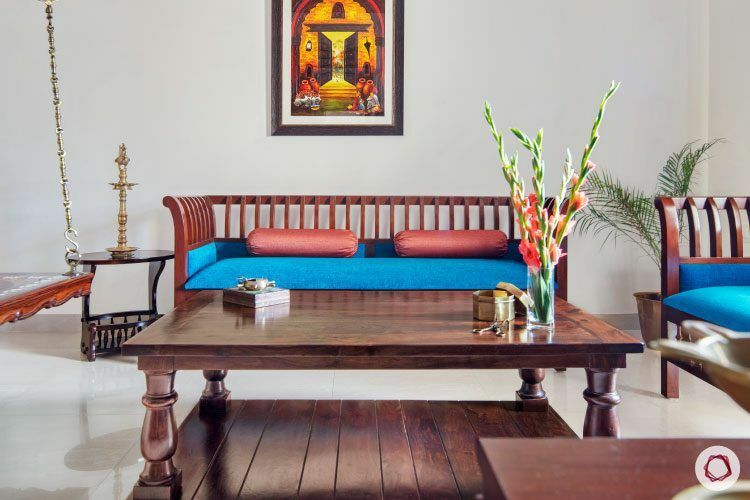 They also wanted a colourful feel-good home with loads of Indian vernacular furniture. Here’s a sneak peek into their home! The pride of the house is probably their living room. 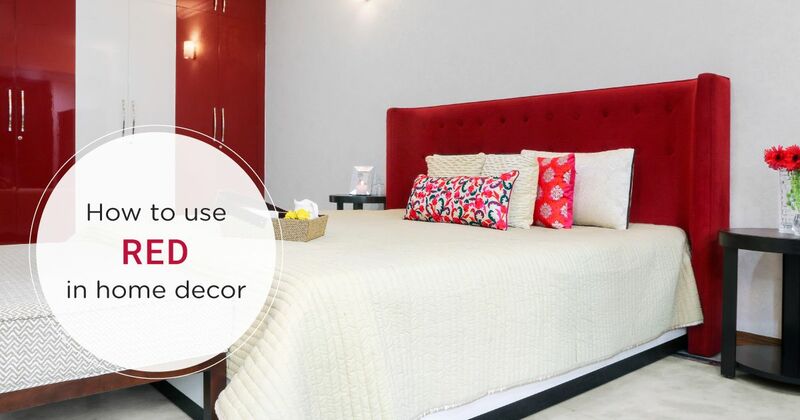 Abhilash and Kamalika dreamt of a room that would instantly transport them home and was inviting at the same time. They wanted a jhoola that is usually present in traditional Kerala and Kolkata homes. To make things interesting, Kajal picked up a jhoola with folk art inscribed on it. Classic Indian sofas were added with a bright peacock blue upholstery that matched with their curtains. Designed to pair perfectly with its surrounding furniture, a coffee table with a wide lower rack was also added. 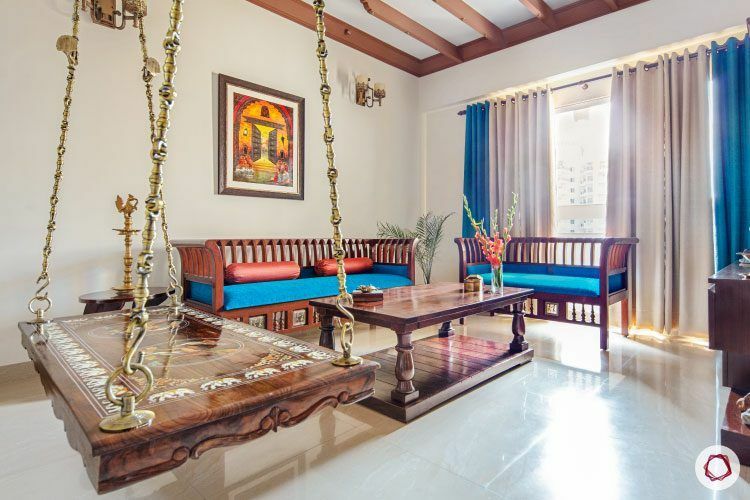 If you look up at the ceiling, Kajal added wooden rafters that are also typically found in traditional Kerala homes. 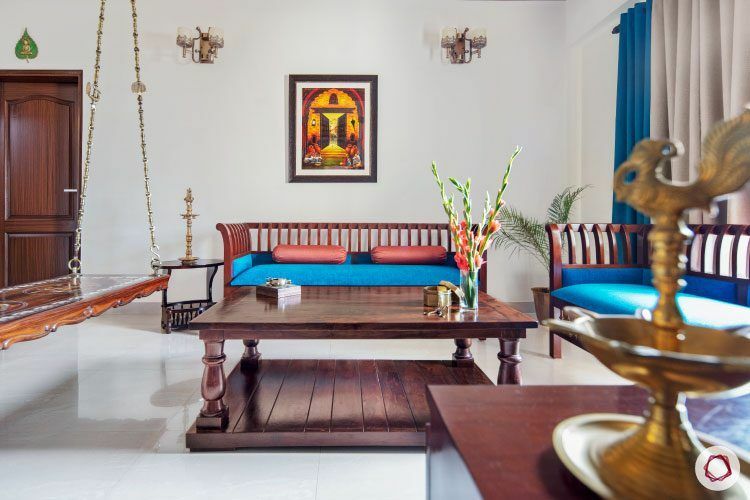 With all the wooden elements in the room and heritage all round, it feels like its a page from a folk story! 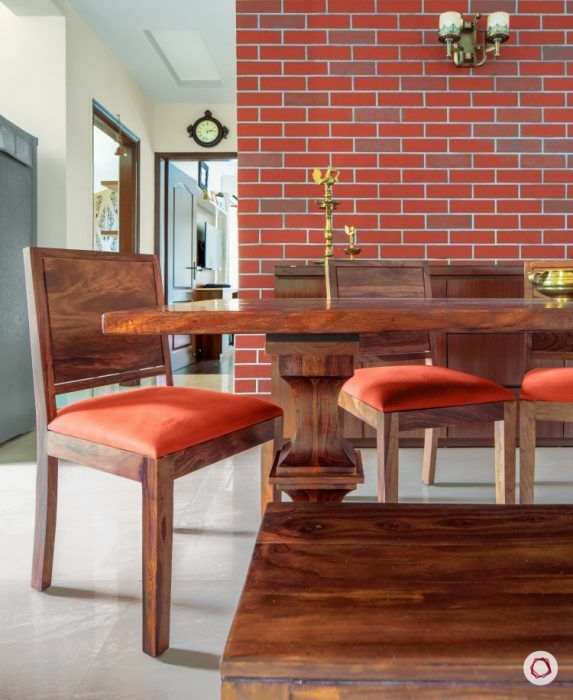 Here’s a dining room that will transport you back in time! 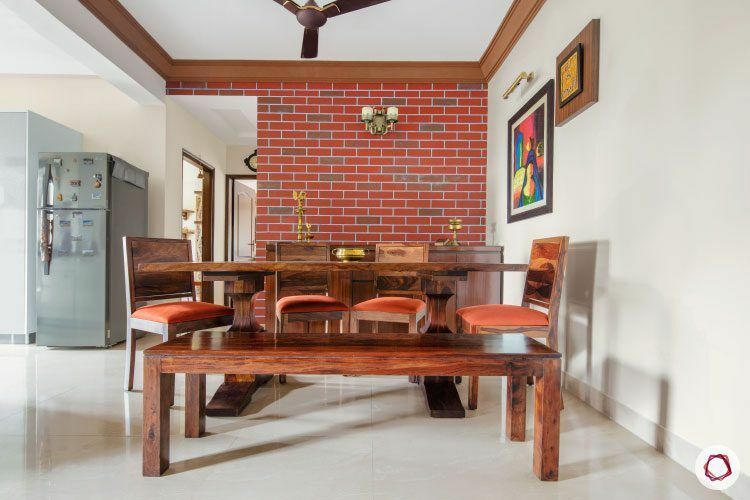 It has a dark wooden table, matching cushioned chairs and a long bench. This space certainly makes your dining experience special! A brick textured paint behind the table also adds to its rich setting. Finally, looking above, you would also notice a wooden box lining around the ceiling. 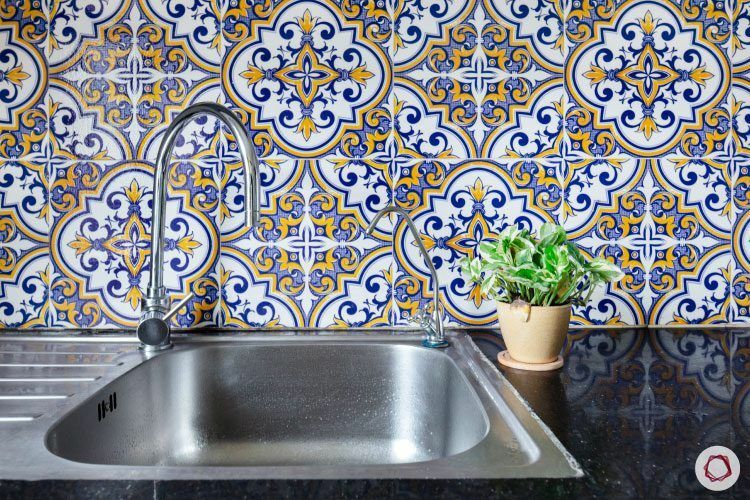 You might want to take a closer look at this kitchen. 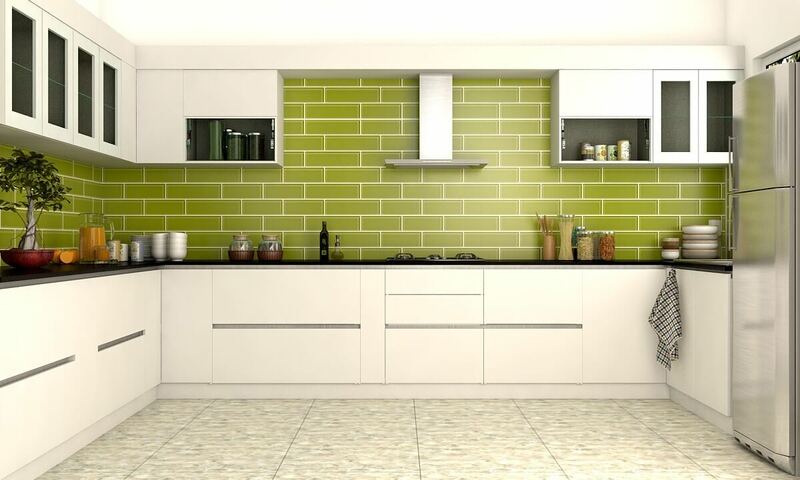 Airy, modern, subtle and an efficient distance between working stations – this meets all the ticks for a perfect kitchen! 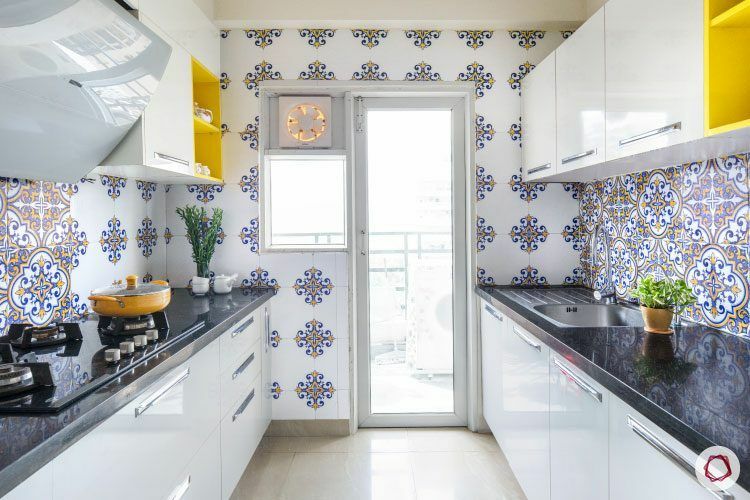 Abhilash and Kamalika wanted a pearly white kitchen with pops of their favourite colour, yellow. 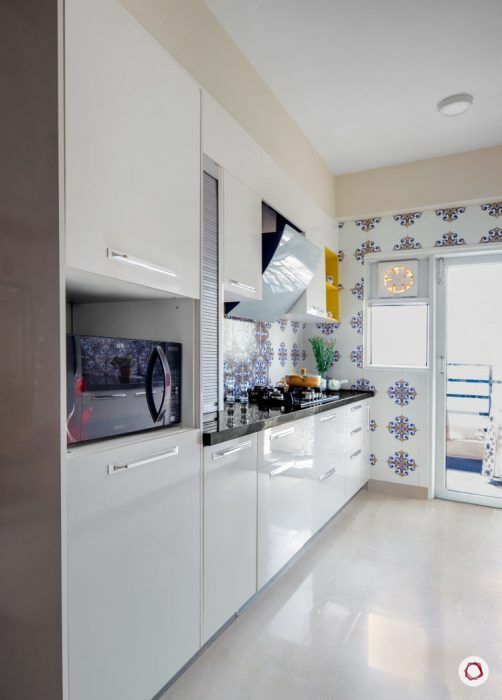 Abhilash and Kamalika wanted their kitchen to be done up in subtle designs. 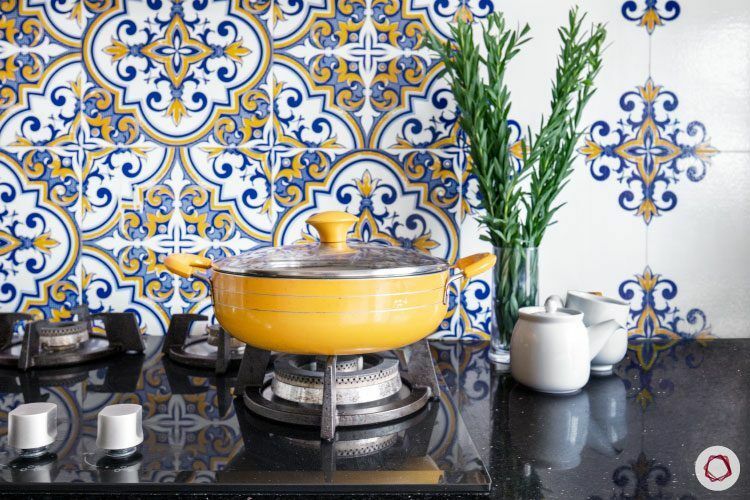 To create this effect, the blue tiles were specially designed and handmade. Yellow open shelves, a granite countertop and laminate cabinets wrapped up the kitchen beautifully. Storage space was a priority for them. Kajal ensured that both sides of the kitchen had plenty of cabinets. 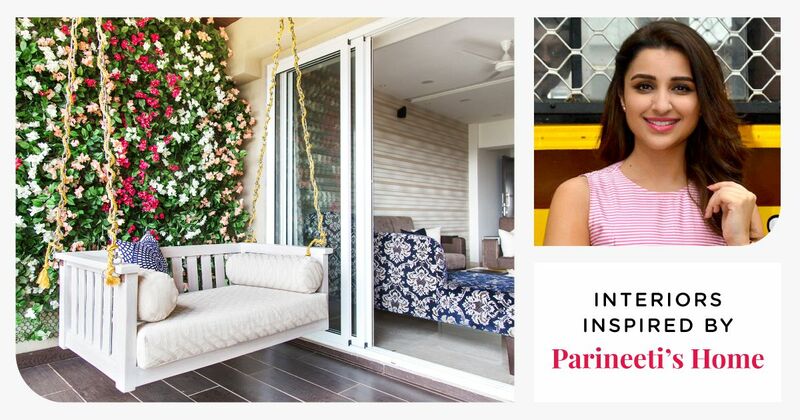 For an extra boost of space, Kajal added a roller shutter to neatly tuck away all the kitchen appliances. 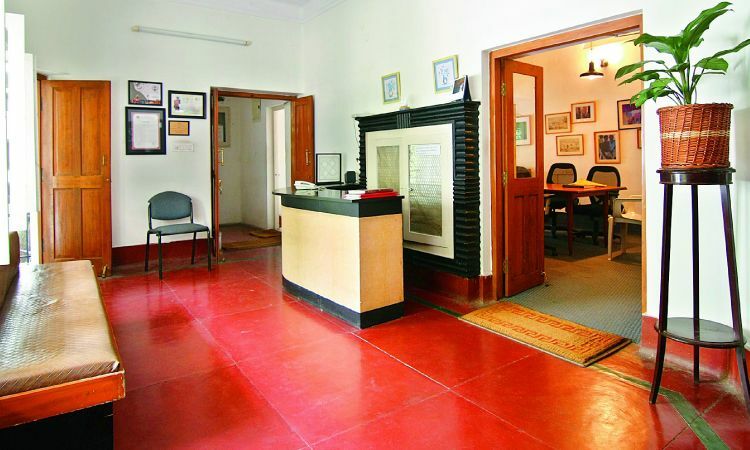 Being lawyers with a hectic schedule, they wanted a room just for their workspace. They desired a room with no added furniture. 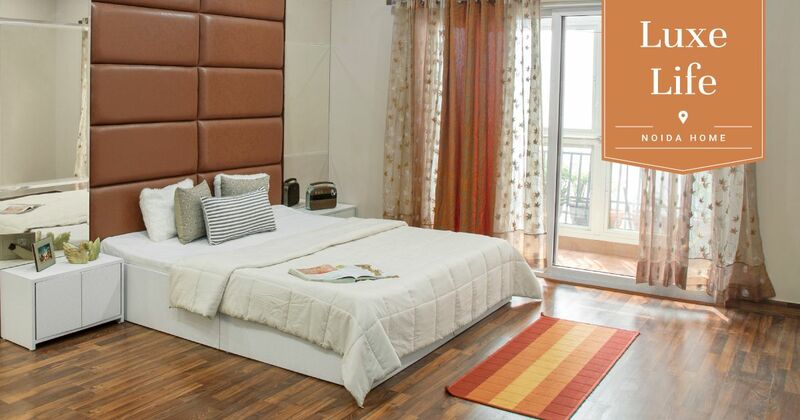 And so, Kajal designed the room with a minimalistic view. 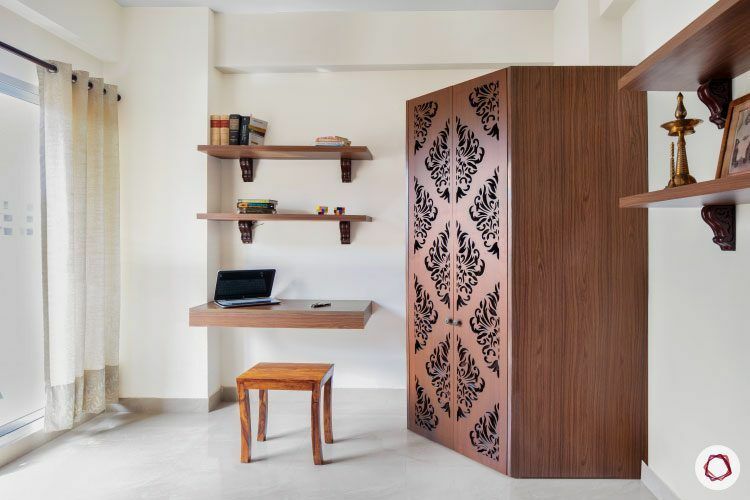 The open racks serve as an elegant addition for their books and essentials. As a result, it also gives the illusion of an airy room. 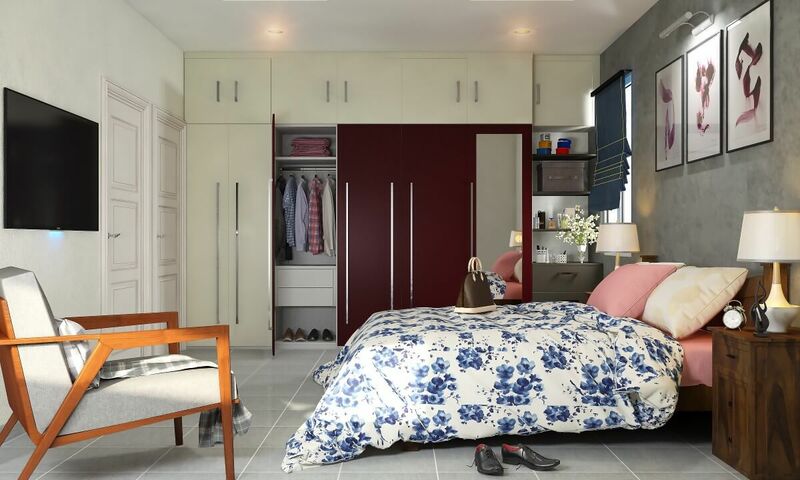 A specially crafted wardrobe stands beautifully against the room’s minimalistic vibe. 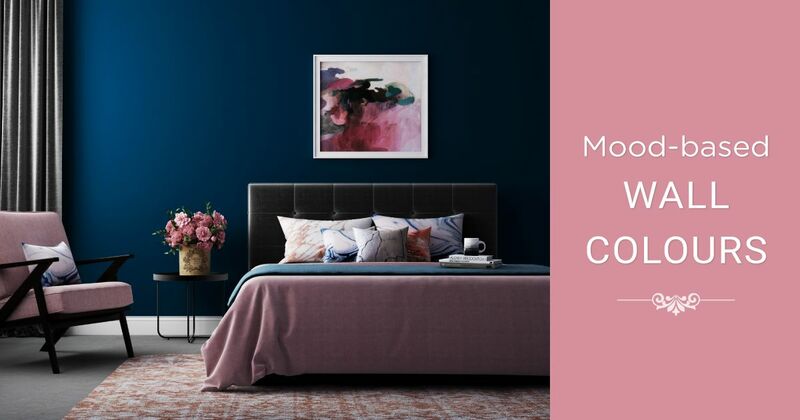 Here’s a bedroom that would leave you in awe! 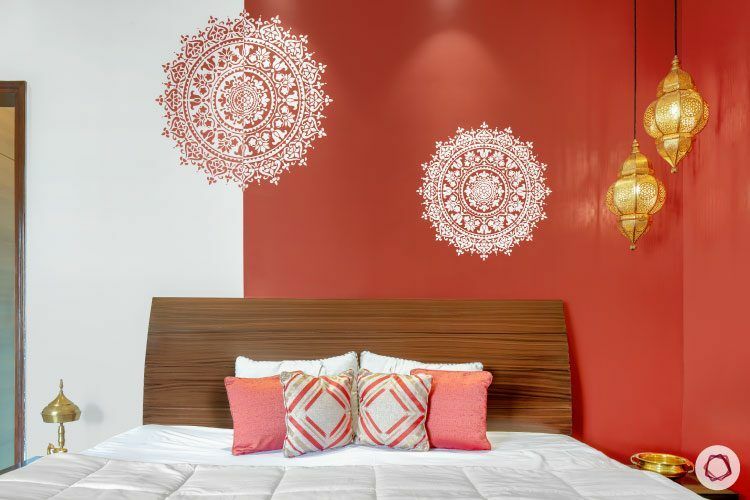 With a dark red wallpaper and wide mandala art in white that was drawn in with a stencil, the room sends out an artistic energy. 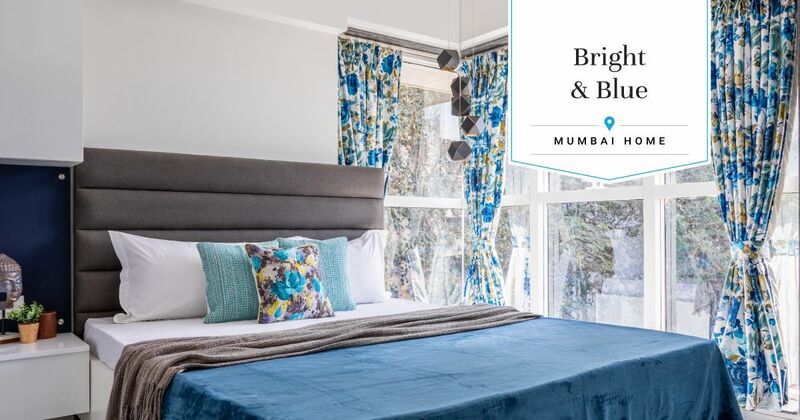 For a touch of softness, Kajal added spotlights and lantern fixtures. When the lights are lit, the mix of the redness from the wallpaper and the yellow glow from the lights creates a mystical illusion right in the corner. Bronze lamps enhanced the room’s pleasing aesthetic as well. 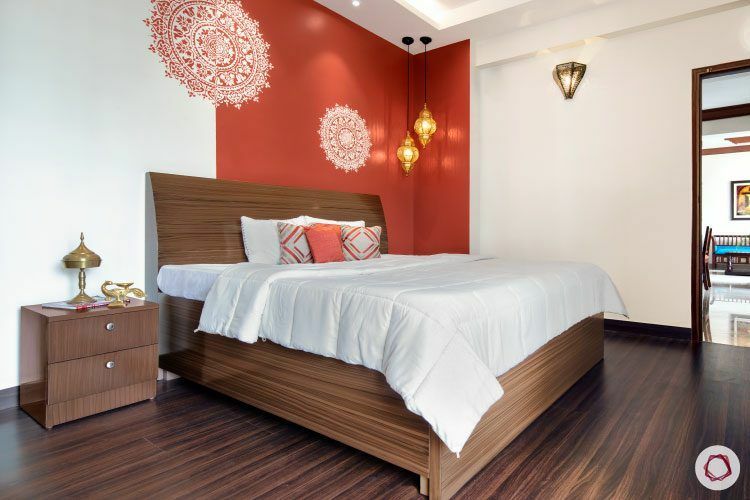 The wooden bedside drawers perfectly blends with the flooring.